What can I send to Hungary? What items are restricted? If you are relocating to Hungary or are going there to study at one of its universities or other educational institutions, you can use Send My Bag to ship your possessions. This means you aren’t restricted to a few suitcases checked into the hold of your plane. You can travel light, meaning you don’t have to get hot and bothered dragging cases onto public transport. You can also use Send My Bag to ship your possessions even if you are going for a shorter period of time. Your journey will be so much more enjoyable if you don’t have to think about your luggage. If you are going to Hungary to enjoy hiking, cycling or skiing, Send My Bag allows you to ship your own equipment so that you don’t have to rent an unfamiliar bicycle or skis when you are there. No matter if you are moving to Hungary or going on holiday there, a lot of hassle can be avoided by sending your luggage and boxes to Hungary with Send My Bag. Knowing that your luggage is being taken care of means you can better enjoy your own journey to Hungary. Send My Bag can ship all sorts of possessions for you ? clothes, books, DVDs, etc. This will make setting up home in Hungary much easier, even if this is just for the duration of a holiday. To learn more about sending luggage to Hungary, visit our ‘How it works’ page, or our ‘FAQs’. Golf is becoming increasingly popular in Hungary, with around 14 courses now on offer. Most of these are handily located close to the capital city of Budapest. Hungary‘s top-rated courses include Pannonia, Royal Balaton and Hencse National. You won’t have to rent golf clubs to enjoy these courses; you can instead have your own golf clubs shipped to Hungary for you with Send My Bag. There is the added benefit of not having to wait around at bag drop or luggage carousels, or having to drag large golf bags behind you. Plus, you can avoid oversized baggage fees from your airline. See more information on how to send golf clubs with Send My Bag, including how to best package your golf clubs. The vineyard regions of Hungary offer excellent cycling opportunities, with many cycle routes available off road. You can send your bicycle to Hungary with Send My Bag, rather than checking it into the hold of your plane and having to pay outsized baggage fees. Why not cycle around Hungary by bike? You can do this by sending your bike to your first hotel and having it picked up at your final hotel. Your bike needs to be taken apart and safely packaged up before being sent to Hungary. Check out our information on bike shipping to learn more. Hungary is a good location for the less serious skier. It’s a great place to learn the basics, in areas such as Kékestetö, Mátraszentistván and Visegrád. You won’t need to rent skis to use the slopes and ski tracks here; you can send your own skis to Hungary with Send My Bag. You can send your skis ahead to Hungary and have them waiting for you on arrival. Find out more about sending skis with Send My Bag and read about how to package your skis safely. If you are relocating to Hungary you will have to consider international removals to Hungary to transport all of your possessions too. Ensure you select a reputable removal company and that you package up all your items carefully so that they arrive in one piece. Use suitable packaging for your items and tape everything up well. If you are taking your full degree course in Hungary, if you are going there on a language course, or if you are conducting research there, Send My Bag can ship everything you need to see you through to the end of your course. Hungary has a number of excellent universities, including the University of Szeged, Eötvös Loránd University and the University of Debrecen. Why not choose to study at one of these universities and have your possessions sent to your student accommodation with Send My Bag? Discover more about student shipping on our student page and find out how to receive your student discount. You can also send parcels to Hungary with Send My Bag. This is a great option if you have a small number of items to send. You may wish to send a care package to a friend living in Hungary. Or a friend may ask you to send them something they accidentally left behind when moving to Hungary. When sending a parcel to Hungary make sure you select a sturdy box and tape it up well so nothing gets damaged in transit. Find out more about sending a parcel and find out what you can send with Send My Bag and how to package your items. If you need to ship large items, like a table or chairs, to Hungary, you could go for air freight. One to two days is the normal transit time, making it a fast service. It can be quite expensive, though, especially if you have a large shipment. Other costs include hiring a customs agent to sort customs clearance for you and arranging transport for your items to and from the airport. If you send internationally by air freight to Hungary your items will likely arrive at Liszt Ferenc, Debrecen or Pécs-Pogány Airports. Sea freight or container shipping is a further option for shipping large bulky items, like a bed or wardrobe. Sea freight shipping can take a number of weeks, and, as Hungary is land-locked, it will take additional time to transport your items from a sea port in a neighbouring country to your destination in Hungary. This option can be cheaper than air freight, but you will still need to pay for the services of a customs agent and will need to sort out how to get your items to and from the ports. This means the cost could be more than expected. When using container shipping to Hungary, your items will most likely arrive by ship at a sea port in another country, such as Croatia or Slovenia. collection was as expected on the day. Large parcel collected from Uk and delivered to a small village in Hungary in just 3 days. Arrived in good condition. All contents safe and undamaged. Consignee will need to provide a copy of their passport and flight tickets to Hungary (dated within 3 months of the arrival of the shipment). The scan of the passport must show both the photo and the passport number. You need to show customs officials that your shipment consists of personal effects. To do so you must complete a brief non-generic packing list online, with entries to be made as follows: "3 x Woollen Jumper, 4 x Cotton T-Shirt, 3 x Polyester Socks", and so on, rather than as "10 x Used Clothing". If brand new or commercial items are found by customs in Hungary, officials may assess your shipment for customs duties and taxes. If you are sending Christmas gifts to Hungary please check with the authorities there so you are aware of any customs duties that need to be paid. You should follow any advice given and attach all necessary documentation. As customs processes and allowances change depending on the country, we suggest travellers take 5 minutes to check how their personal circumstances and what they are sending will be viewed under prevailing Hungarian customs regulations. Hungary has a continental climate with hot summers and cold winters. In summer the temperature can reach 30-35°C and can dip as low as -10 or -20°C in winter. If you are in Hungary in the winter, you can warm up by taking the water in one of the thermal springs there. 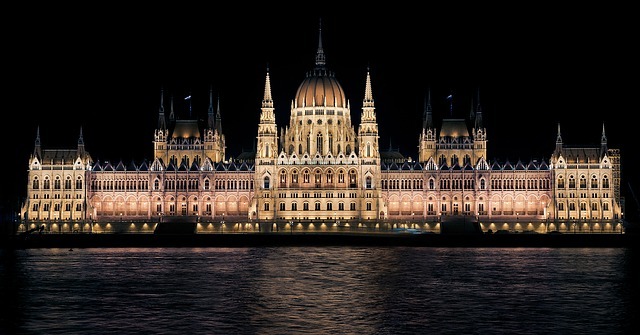 Most visitors to Hungary go to the capital city of Budapest, which is a picturesque city full of historical sites. These include the UNESCO World Heritage Sites of the Danube embankments and the Buda Castle District, which is also Budapest’s old town. Other areas of Budapest recognised by UNESCO are Heroes’ Square and Andrássy Avenue. Outside of the capital city, visitors can enjoy hiking and cycling in the Hungarian countryside, which is particularly enjoyable in the winegrowing region of Badacsony. Easy-going skiing can also be enjoyed in snowy conditions in areas such as the Mátra Hills.